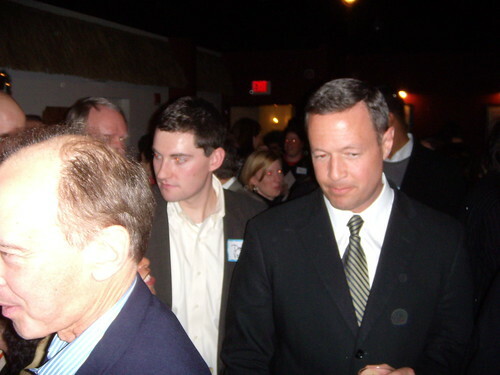 Governor Martin O'Malley, a little tuckered-out from supporting Hillary in New Hampshire, makes an appearance at Delegate Hucker's fundraiser at McGinty's on Sunday. HITTING THE CAMPAIGN TRAIL, SORT OF: Over the weekend, State Del. Tom Hucker (D-Dist. 20) had a fundraiser to kick off his re-election campaign . . . for 2010. Two years may be a while away, but you'll be pleasantly surprised by who showed up (for up to $1,000 a head!) to support the freshman legislator. THE NEXT BIG THING? : Last night, local residents got a first look at Washington Adventist Hospital's potential new home in Calverton. Why does hospital President Jere Stocks think this project will change the face of East County? You'll definitely want to find out. CALLING OFF RIDE-ON CUTS: Ike Leggett's proposed reductions in Ride-On service have the Action Committee for Transit on high alert. How do they plan to respond? We'll be checking out their monthly meeting tonight. Come back soon! Just Up The Pike is back and ready to go. Why on Earth do you like Martin "Tax Everything in the State" O'Malley????????? ?